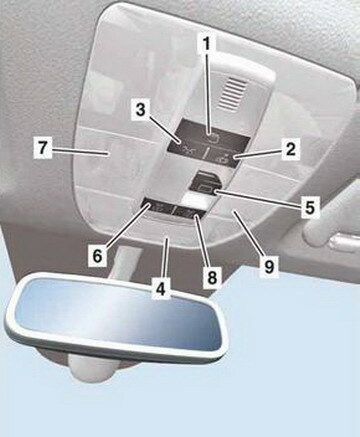 Pressing the door contact ON and OFF switch (2) activates the automatic control for the interior illumination. Pressing the door contact ON and OFF switch (2) again switches off the automatic control for the interior illumination. 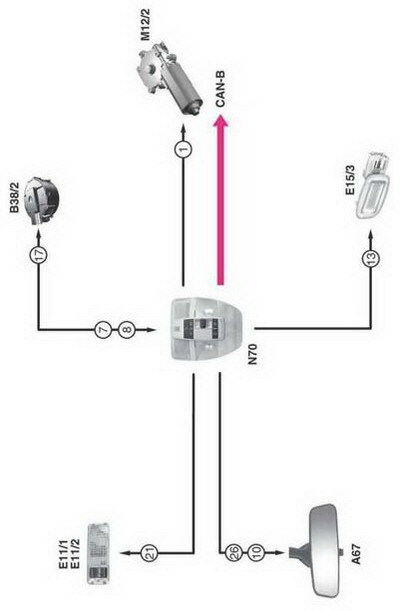 Pressing the dome lamp ON and OFF switch (3) only switches the front interior illumination (4) in the overhead control panel on or off. Circuit 15R must be switched on to actuate the panoramic lamella sliding roof. Pulling the roof switch (5) towards the rear and holding it there opens the panoramic lamella sliding roof to the vent position. In the vent position, only the foremost lamella of the panoramic lamella sliding roof is raised at the rear. Pulling the roof switch (5) towards the rear again and holding it there opens the panoramic lamella sliding roof for the duration of the actuation. The panoramic lamella sliding roof is always closed by pressing the roof switch (5) to the front and holding it there until the roof is fully closed. Pressing the left front reading lamp switch (6) switches the left front reading lamp (7) in the overhead control panel on or off. Pressing the right front reading lamp switch (8) switches the right front reading lamp (9) in the overhead control panel on or off. • The cover of the panoramic lamella sliding roof protects against solar radiation and can be operated by hand regardless of the position of the lamella roof. • The panoramic lamella sliding roof does not have an automatic function. In this section we have some useful information about some Mercedes Benz 169 - 245 OverHead Control System and it features.